Are you currently working in Germany? Have you worked in Germany in any of the last 4 years? Have you not yet filed your German Income tax return for year 2015, 2016, 2017 and 2018 ? Then you have a possibility to get some refund from German tax office. 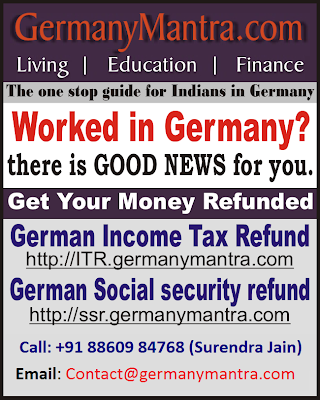 You can understand about the German Tax system here, know your eligibility for refund and also get answers to all frequently asked questions on this website. Contact us to complete formalities to get your refund. I have got Income tax refund for 2008 and 2009, Thanks for your help Surendra. I have referred your services to my friends also. They will contact you for Income tax and SSN refund. Great service to get refund for year 2008. I have received my Income tax refund for 2010 within 2 months. Thanks for your reliable services. I am referring your services to my friends and they will definitely contact you. It has been nice interacting with you. Thanks for helping me out to get Income tax refund for year 2007 and refund of Social security.